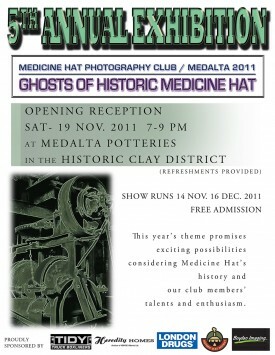 After being re-scheduled, the Medicine Hat Photography Club is excited to celebrate the opening of its 5th Annual Exhibition on Saturday, November 19th, 2011. Entitled “Ghosts of Historic Medicine Hat”, the exhibit steps back in time to showcase the vast history of Medicine Hat, captured through the “passionate camera eyes” of club members. 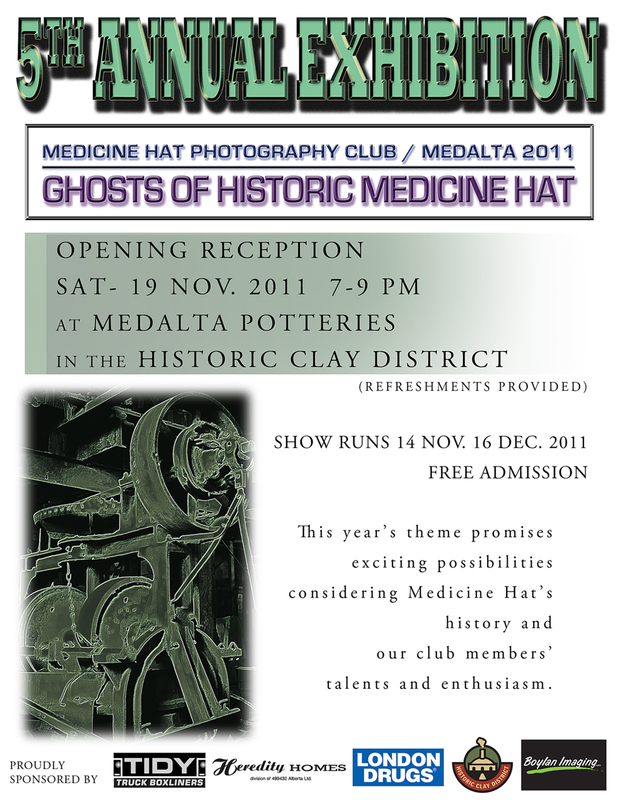 Join club members (and ghosts) for the official ‘Show Reception’ between 7-9pm in the beautifully renovated gallery of the Medalta Potteries National Historic Site. Support from local business makes it possible, once again, to shine the spotlight on Medicine Hat’s local talent. The support of sponsors such as Medalta, Heredity Homes, London Drugs, Tidy Truck Boxliners and Boylan Imaging plays an integral part in bringing this exhibition to the community. In excess of 40 submissions are expected this year, the theme for which is a result of collaboration between the Medalta Gallery Committee and club members. With a theme as rich in possibilities as Medicine Hat is in history, club members are sure to demonstrate their talents through a diverse collection of works. The free exhibit will be on display from 14 November through until 16 December. The Medicine Hat Photography Club meets the second Thursday of each month at the Cultural Center, beginning at 7pm. They are the voice of photography within the community, exploring the limits of today’s technology and technique, helping understand the jargon and getting down to the essentials of it all, “making photographs.” The group is active through exhibitions, seminars, field trips, photo contests, and meetings that are always informative, exciting, and inspirational. This entry was posted on Wednesday, November 2nd, 2011 at 4:34 PM and is filed under Art Events, Medalta Squared Gallery. You can follow any responses to this entry through the RSS 2.0 feed. You can leave a response, or trackback from your own site.